Do the Un-Ordinary to Experience the Extraordinary! Mary should have been in the kitchen with Martha, but she sat at the feet of Jesus. When Naomi commanded her daughter in law to go back home, Ruth vowed to stay with her. She played a central role in God’s plan to bring Jesus into the world. Because these women broke the rules, God was able to do so much more with their lives. 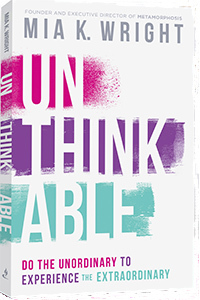 Unthinkable shows you what happens when you break out of the mold and join hands with the One whose dreams are bigger than you can think!